A wide variety of tools such as sweeps, chisels, and twisted shovels are available for the operator to maintain surface residue and ground profile under varying weather and soil conditions. 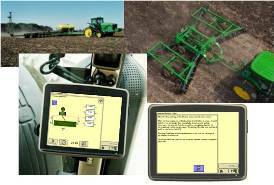 Spend less time taking measurements and trying to remember how your implement was setup last year. With John Deere Implement Detection, simply connect your implement to the tractor. All of the settings used from the previous year or the factory-installed settings on new machines will automatically enter into the GreenStar 3 2630 Display. When an implement with Implement Detection is connected to a tractor utilizing a GreenStar 3 2630, a notification will be populated informing the operator that an implement is now on the CANBUS. The one page notification will indicate the implement's name, connection type, and other settings saved to the implement controller. The notification will address each individual setting showing the operator whether the implement settings successfully transferred to the 2630 or not. From this notification, users have the option to accept settings and move to the run page, or they can select the Equipment soft key that takes them to the equipment setup page so they can make adjustments to implement settings if necessary. All changes to implement settings will override previous settings and will be stored to the controller. If the implement is moved between tractors or displays switched, the implement settings are automatically sent to the display once the ISO connector is reconnected. John Deere Implement Detection provides a Green-on-Green advantage that addresses the single-most frustrating issue in the world of precision agriculture today - usability. Implement Detection will allow John Deere precision technology users to spend more time working and less time setting up their equipment. Enhancements such as this also begin to eliminate the mistakes made by operators in the field as well as reduce the dependence on others to help get the equipment setup like it was the prior year. Producers with non-John Deere implements can still see the benefits of John Deere Implement Detection when paired with a GreenStar 3 2630 Display and an independent Implement Detection controller. John Deere Implement Detection is designed to be paired with equipment not currently utilizing a controller; such equipment includes tillage implements, planter/seeders, dry-box fertilizer spreaders and sprayers. NOTE: Implement Detection is not compatible with AccuDepth™ implement system. Operators are requiring faster field working speeds, larger implements, and tractors because of a dramatic increase in farm size. The market is asking for and receiving tractors with more torque, more weight, and more horsepower. Accommodating 600 engine horsepower tractors requires more from implement frame and hitch components, including thicker frame tubes, additional diagonal bracing, and frame gussets. The frame is constructed of continuous 102-mm x 102-mm (4-in. x 4-in.) cross members inserted through 51-mm x 152-mm (2-in. x 6-in. ), 76-mm x 152-mm (3-in. x 6-in. ), and 102-mm x 152-mm (4-in. x 6-in.) fore-aft members. The mainframe boasts a structure made up of 102-mm x 152-mm (4-in. x 6-in.) fore-aft tubes. The large frame member sizes, joint welds, and wheel module placement adds to the structural integrity, providing a stable front-to-rear and side-to-side operation. The 2410 Drawn Chisel Plow is designed for precise, accurate depth control. Precise depth control is very important for conservation of moisture, fertilizer placement, and soil management. Soil layers of differing soil type vary across farms and even across fields. The ability to adjust for these conditions is extremely important to producers today. There are two choices in providing this adjustment. AccuDepth™ comes as standard equipment or single point depth control is available as an option. Both provide accurate depth control to best utilize available tractor horsepower. With AccuDepth, these adjustments can be done on the move, increasing productivity and making the day go easier for operators. AccuDepth provides accurate and precise depth control by the use of individual wheel sensors and electronic circuitry to perform tasks of leveling and depth measurements unprecedented in the industry until now. Accurate depth is displayed to the nearest 2.5 mm (1/10 in.). The field-proven single-point depth control offers the producer one easy, front-mounted crank to dial in their depth control for the entire implement. From one location, this adjustment is easily and quickly completed. The floating hitch, frame strength of the Tube-Thru-Tube™ manufacturing, and the wheel package placement allow the 2410 to offer unmatched consistency of depth (front-to-back and side-to-side). Fuel can be saved, soil can be mixed and shattered, and accurate depth can be maintained. This represents true soil management for the producer. Provide a consistent working depth in uneven ground for level seedbeds and complete weed control. Staggered wheel design provides extra room for residue flow, obstacles, and transport stability. 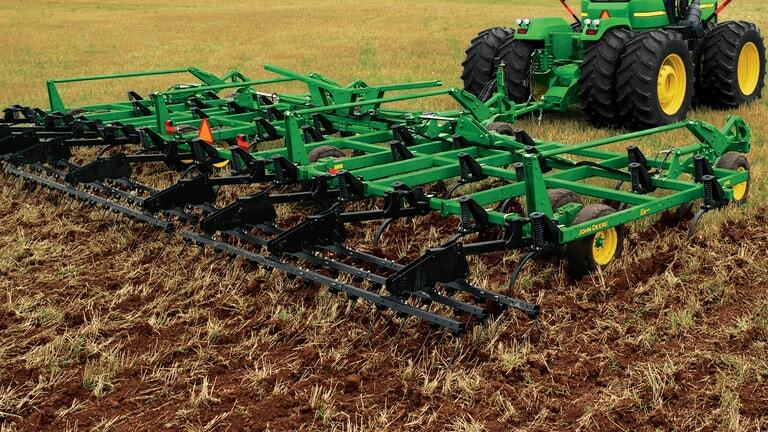 The 2410 Chisel Plow has excellent residue-handling capability in primary tillage at all residue levels. Typical percents of residue cover remaining from the 2410 are listed in the following table. The percentages do not take into account variables such as the condition of the residue, speed, and soil type. **Fragile residue includes crops like soybeans, edible beans, peas, wheat (less than 45 bu), sunflower, peanuts, and cotton. The 2410 Drawn Chisel Plow is available in rigid and rigid fold, three-section folding, and five-section folding frame models. NOTE: Tru-Depth standards are available through 10.06 m (33 ft) only. 11, 8 to 17, 4 ft, in. 17, 6 to 20, 6 ft, in. 30, 8 to 43, 0 (15 ft mainframe) ft, in. 20, 7 (15 ft mainframe) ft, in. 12, 9 to 17, 7 (15 ft mainframe) ft, in. 14, 5 to 17, 5 (15 ft mainframe) ft, in. Maximum depth Rigid, TruPosition - 8 max; Spring-reset, TruDepth - 12 max in. Description T-Hitch, 6 x 10 on Rigid and 3-section, 6 x 12 on 5-section in. Tubing 4 x 4 high strength, box beam steel cross tubes, 2 x 5 end tubes, patented 4-bar tube-through-tube frame design, welded construction in. Underframe clearance Rigid and TruPosition - 28; Spring-reset and TruDepth - 32 in. Tubing size 3 x 5 rectangular box construction in.